Reflecting the image of God in our relationships. These wise words from someone who knows what he is talking about. My daughter refered me to this post by Todd Raleigh. He is a former professional baseball player, former baseball coach at University of Tennessee and Western Carolina University, as well as the father of 4, all who are involved in sports. I called his wife Stephanie this week and received permission to share his post because I think ALL parents need to read this. for the sake of their kids. Grandparents need to pay heed as well. Not only the above but I’m also a parent that has gone through from Tball to College. Don’t think anyone else in Jackson County has my experience in these two areas combined. Having a business on main street there is never a day that goes by that at least one person comes in to talk about their kid and baseball. That includes Haywood, Macon, Buncombe and the western counties. Here is my message. Surround yourself with good people. Winning and losing isn’t important. It is life lessons and development. Your job as a parent is to get them to the game on time. Enjoy the game and support them. Your job isn’t to coach from the stands, second guess the coach and quit every time you don’t like what is going on. Safe to say that Cal is a decent player. How many travel ball teams did he play on growing up?? How about one! He didn’t always bat 3rd, he played the outfield, he sat the bench etc.. When it didn’t go our way we didn’t pick up our bat and go home or call another travel ball coach and try to switch teams. The grass isn’t always greener on the other side. Cal’s baseball coaches didn’t have a great amount of baseball experience but they were good men. They helped shape Cal. I did 2 tv interviews today in Tallahassee on 2 subjects. First was what mainly about how great of a kid Cal was and how the people in Tallahassee have adopted him and adore him. I was very proud and surprised to hear that. The 2nd was how he came to FSU so prepared as a Freshman to play not just physically but mentally. He is the starting catcher and batting 3rd on one of the best teams in the country. They asked me point blank why he was so prepared. I told them this. When he joined a team that was his team. At the end of each game he was asked if he played as hard as he could. Performance was never brought up. He was told the coach was always right no matter what. He was told he would be the first one on the field every inning. He was told he was to be the first one out of the dugout to congratulate his teammate. He was told he would hustle regardless of the score for the entire game. He was told he would shut his mouth and respect his opponent and the game itself. He was told when the game started he was on his on. Don’t look to me for help and he was made to carry his bag to and from the game. Now this wasn’t easy. We had plenty of bumps along the way. He didn’t run every ball out when he was 9. He was far from perfect on any of that. Still is a work in progress. Me and his mom stayed consistent with our approach. Stay with good people and play the game the right way. When he got older we had travel teams from California to Texas wanting him. He stayed with his group. Now every parent has to do what is best for their kid but teaching your kid to quit every time it doesn’t go right isn’t teaching him anything. Bad mouthing the coaches isn’t giving him life lessons that will serve him down the road. Worried about batting averages or winning games isn’t important. Wanting to win and preparing to win is important. 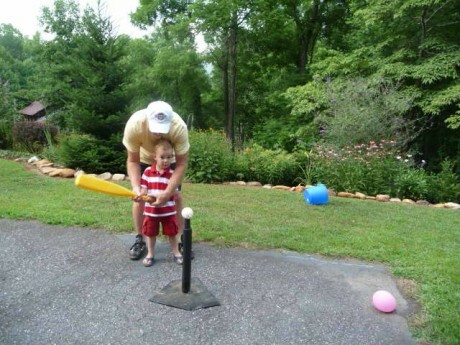 Getting your kid a one hour hitting lesson once a week isn’t going to separate him from the others. Character and attitude will! A parent can’t control the starting line up, the position they play, can’t control how many hits their kids get, can’t control the weather. They can control their kids state of mind, they can control their kids attitude, they can control their kids effort and hustle. They can control their level of respect they show their coaches. They can control getting them to bed the night before. They can control making them practice during the week. They can control not yelling at them in a middle of a game. Let’s take all our energy as parents and focus on what we can control (your kid) and not what we can’t control. Let’s be part of the solution not part of the problem. I have had the privledge of knowing the Raleighs two oldest children. They are both great examples of what their dad wrote. Listen to advice and accept discipline, and at the end you will be counted among the wise. This entry was posted in Parenting. Me and Mr. Jones..... on the Mercy Ship!